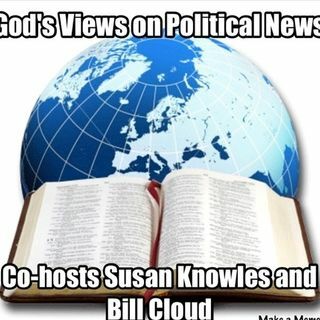 Join us for a LIVE show every Tuesday at 10amPT/1pmET where you will be able to ask questions and weigh in on topics of discussion with your co-hosts Susan Knowles and Bill Cloud. All you need to do is follow the link to the GOD'S VIEWS ON POLITICAL ... See More NEWS page on Facebook. Each week we'll take your questions LIVE during our discussion and hopefully bring you some clarity on what is happening from a Biblical perspective as well. Susan has also been a frequent guest on The Morning Blaze with Doc Thompson. In addition, she has made guest appearances on AM 760 KFMB, 600 KOGO News Radio San Diego, 106.7 WYAY FM in Atlanta, News Radio 610 WIOD in Miami, Fla. and Overnight America with Jon Grayson. Her shows are also featured on MOJO50.